Universal has finally unveiled the official photos and details for that “Limited Edition” box set of “The Big Lebowski” on 4K UHD Blu-ray, and it’s quite the sight to behold. The Dude would abide. The set will include (as pictured above) a collectible bag, a bowling ball pencil holder, a polishing cloth (rug) and sweater packaging (to hold the 4K release). “The Big Lebowski 20th Anniversary Limited Edition“ set, slated for an October 16th release, is now available for PRE-ORDER over at Amazon – priced more affordably than you’d expect. Go have a look for yourself, and see. Tech specs for the 4K UHD Blu-ray releases include full 2160p 4K video in the 1.85:1 aspect ratio with HDR10 form of High Dynamic Range and DTS: X sound. No new bonus materials are slated to be included on either this version, or the standard 4K UHD Blu-ray release. For more information on the release and such refer to our previous news story, that came from a rumor that turned out to be true. That’s where some of you have may have seen this packaging (or similar) from: the Italian import available that spawned the rumor. Further below, after the break, you can find even more photos of this box set. 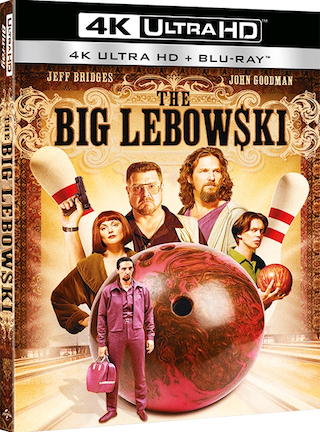 OK, I had reported a rumor to you folks back in July discussing there was a listing for the 1998 Coen Brothers film “The Big Lebowski” coming to 4K UHD Blu-ray possibly later this year in the United States. That was because of a listing found over on the Italian Amazon for a gift set. That rumor has now turned into pretty much being a reality, minus the official announcement from the studio (Universal). We now can find two listings on the American Amazon website, that both appear to be the 4K release. The release date for this “20th Anniversary Edition” is slated for October 16th. The two versions available for PRE-ORDER over at Amazon most likely are the standard 4K UHD Blu-ray release and a 4K UHD Blu-ray gift set release, as we saw Italy was getting. UPDATE: Tech specs for the 4K release include 2160p with HDR10 form of High Dynamic Range (HDR) and DTS:X immersive sound. It would appear the bonus materials will just be the original Blu-ray Disc contents, as listed on Amazon’s product description. Stay tuned for further updates, as new information comes to light. Below, after the break, you can find an image of the box set shown over on the Italian Amazon page. As you’ll see above there is a 4K UHD Blu-ray box set of “The Big Lebowski” coming to Italy via listings on various retailers via Universal Studios. Now this leads me to believe that we could see a release date around the same time here in the United States on 4K UHD Blu-ray around October 24th – as that is the release date in Italy. October 22nd would fall on a Tuesday or October 29th would as well here in the states. So, that could be possibly when we will get our hands on this amazingly cool looking box set and hopefully a standard 4K release as well. Stay tuned for any updates, including a pre-order on the US version of Amazon. Below you’ll find an excerpt taken (and translated) from a news story about this Italian 4K release of the film. Amazon Italy is currently listing an interesting reissue of the cult comedy The Coen Brothers. 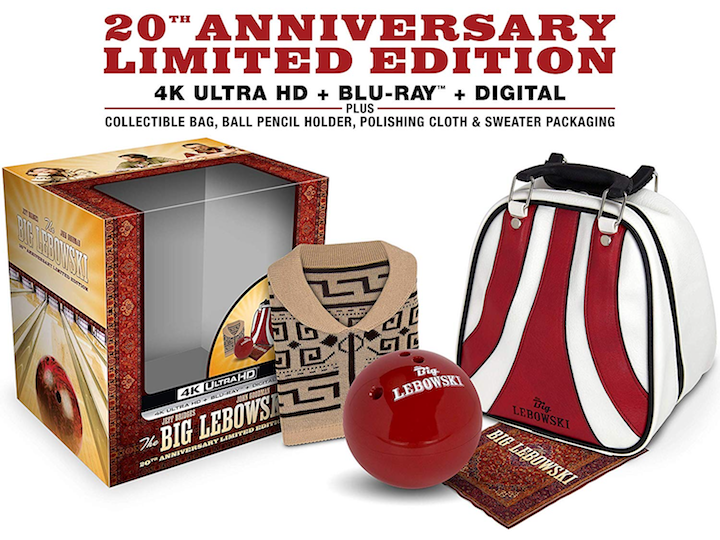 The ” The Big Lebowski” – Collector’s Edition is equipped with the 4K version of the film on UHD Blu-ray (including German soundtrack) and also has a lot of special content such as an exclusive bag for the bowling ballet, a mini-cardigan by Drugo, a bowling ball and much more. Available from 24th October 2018 .